Home Sweet Home – that’s what Streatham feels like to me because it was actually the first place in London that I’ve ever lived in. That’s all 6 years ago now (wow, already!) and it feels crazy how quickly time has flown by. So much has changed in the Streatham neighbourhood since I moved away – some of the street corners are barely recognisable since I left the area in 2013. So many more high street shops have popped up, alongside more independent cafe’s of which Café Barcelona is one! 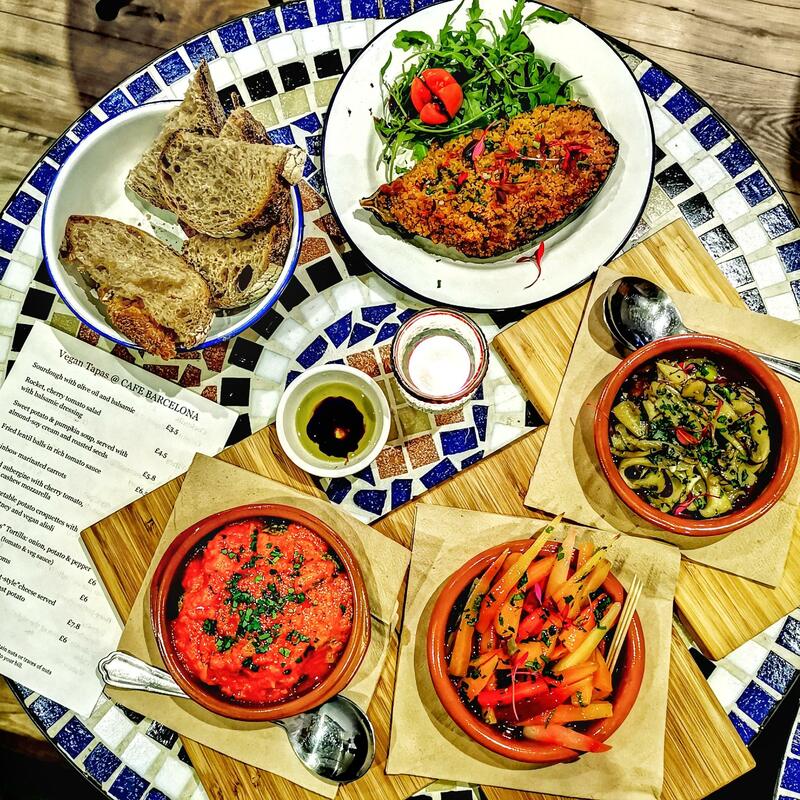 Café Barcelona‘s vegan tapas menu offers a great variety of dishes – from salad over soup to Baked Aubergine with cherry tomato, basil and cashew mozzarella – and everyone should be able to find a few favourites here. My recommendation would be to start with the Sourdough Bread alongside some olive oil and balsamic – it’s a classic and simply too good not to start with it. The bread that Café Barcelona uses was also super fresh and delicious – definitely a tasty way to start a tapas night! When I visited the cafe to try their vegan options we’ve been given little tasters of each of the dishes, so the sizes of the actual tapas might differ slightly from my photos – however you can perfectly see that all the dishes look absolutely scrumptious! 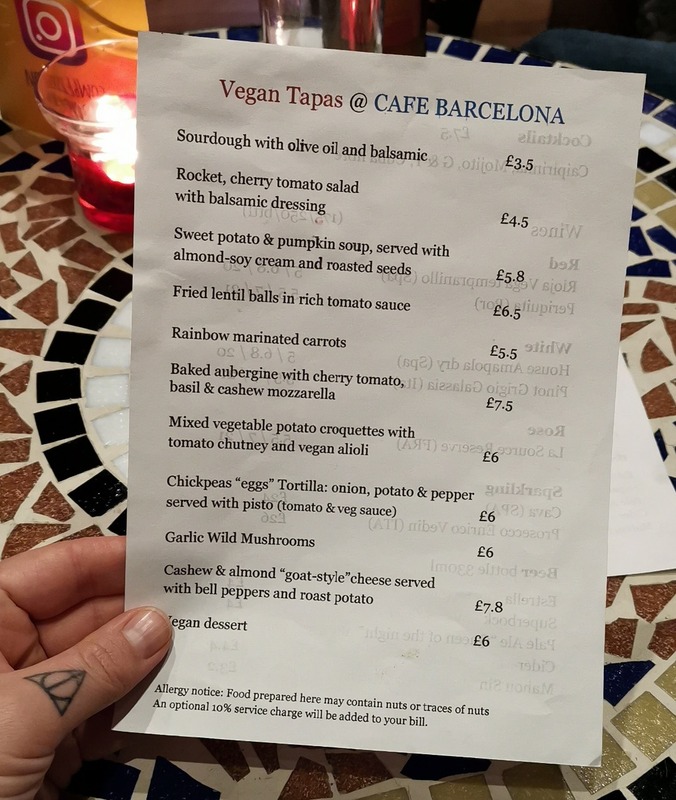 All in all we were very impressed with the vegan food at Café Barcelona – they also had a great selection of drinks, some of which we recognised from our holiday trips! We particularly like Super Bock from Portugal for example – and this is also vegan friendly! Not many places seem to serve it in London, so this was an exciting drinks menu find. I’m so happy to see vegan food options popping up more across South London. Having lived there for over a year I know there are not plenty and the ones I know I can probably count on one hand, so I definitely encourage this shift!